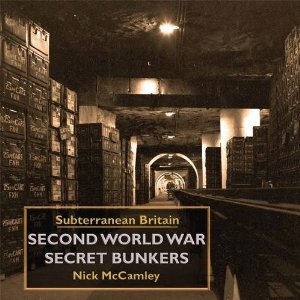 An underground 'city' which has taken thousands of men seven years to construct houses Britain's biggest ammunition dump. Details are secret but it can be said that the stocks are of incredible size. This bomb-proof 'city' has barracks, offices, a telephone exchange, electric lifts, and an air conditioning plant. There is a duplicate electricity generating plant big enough to provide power and light for a city above ground. There are fourteen miles of conveyor belts for carrying shells from the main entrances to the storage areas. The nerve centre of this vast arsenal, the telephone exchange, is staffed by members of the ATS. One of them, Lance-Corporal Edna Bullin, has been working there for two years and likes it. 'You forget there is an outside world,' she said. They constructed so many tunnels that the officer in charge says it took him three months to learn his way about. New book by Nick McCamley, just published. Large format colour book, lavishly illustrated, which includes all sites on this website and more. For further information click on the book cover below, or use the Buy Now link to purchase the book direct from Folly Books Ltd.